Where on the globe were you last Saturday? The world’s coolest place to be on March 12 was in LAS’s Grande Salle, where the second annual GLOBE Day science fair showcased almost 30 science and social studies projects from LAS students in 8th, 9th, and 11th grades. Students presented the fruits of their hard work over the winter term, when they researched everything from glaciers to tourists to castles–and forests and animals and more. Some presented movies, others posters or slide shows, and a few created scale models. The best of their work will soon be displayed on our website; stay tuned for the announcement. 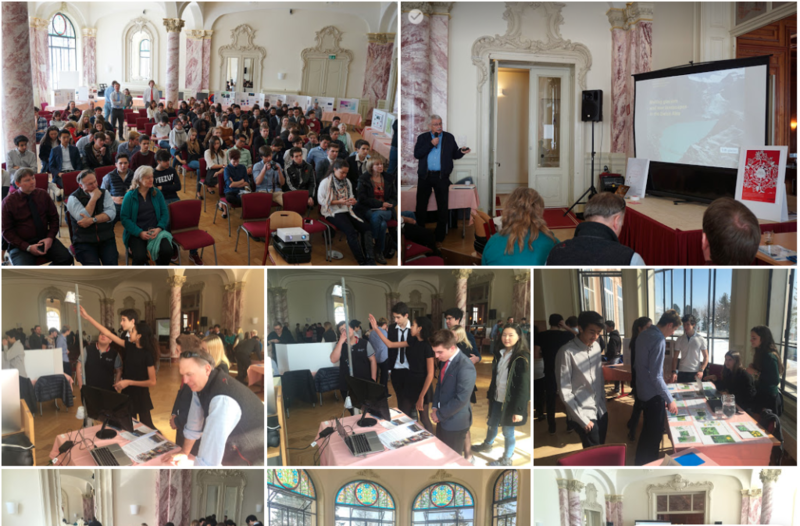 After the student projects had all been presented, we listened to our keynote speaker, the world renowned glaciologist Dr. Wilfried Haeberli, from the University of Zurich. Dr. Haeberli opened our eyes to how rapidly Switzerland’s glaciers are disappearing (they’ll all be gone in about 40 years) and to the landscape changes that will result. It seems that because we’re so far from an ocean, the Swiss Alps are warming about two times faster than the world as a whole. We’ll need all the innovation of our young citizen scientists as we move rapidly into these ever-changing times. To view a gallery of images, please click on the photo collage.